The GBI Summer School proved to be even better than anticipated or described. As a newcomer to the discipline, I had expected the course to provide a broad overview of topics and speakers. Indeed, while broad, the degree of expertise and timely subject material provided an excellent and comprehensive survey of the discipline in global and local settings. Moreover, the students provided another dimension of diversity, both in nationalities and areas of expertise. The speakers made their presentation materials readily available, answered questions, and were willing to address topics of interest offline. I would strongly recommend the course to both novices and subject matter experts alike. The course especially demonstrated the need, relevance, and desirability for global bioethics to be better incorporated into public policy formulation. The GBI Summer School, in the heart of NYC’s Pace University Campus, is a fantastic opportunity! International scholars and professionals from all over the world attended the program, contributing their experiences and engaging with bioethics experts. The City of New York – with the nearby Pace University Campus, Brooklyn Bridge, City Hall, and 9/11 Memorial – provided the perfect setting to discuss the global ethical challenges in technology and medicine. Discussions ranged from law and politics to culture and psychology, encompassing the ethical dilemmas that define the 21st century. I have immensely enjoyed not just the internationally known faculty but also hearing from the learners who come from all over the world representing diverse fields. No single instructor could have done justice to the diversity of topics covered during the sessions. Field visits to the UN and Memorial Sloan Kettering Cancer Center provided an amazing glimpse into the real world translation of the classroom discussion. Arriving on my first day, I was struck by how simple and convenient it was to find the Summer School onsite. Dr. Lita’s genial welcome assuaged any trepidation I still harbored from my flight to the United States. Our first lecture was delivered by Dr. Licciardi, fertility expert at NYU Langone Medical Center, who spoke eloquently about infertility affliction, detailing deep medical knowledge on infertility and leading clinics’ treatment attempts. What started as an informed medical presentation eventually became a lively, open and honest discussion on the ethical quandaries encountered in IVF treatment. This was followed with a presentation by Dr. Berman, Professor at Mount Sinai Beth Israel Medical Center and Associate Dean for Quality and Patient Safety in the Department of Obstetrics, Gynecology and Reproductive Science, about his personal thoughts on the bonds encountered between doctor and patient, and his reflections on the role of humanism in medicine. While personally moving, it further revealed to me that patient care can move beyond a purely practical or physical perspective, to one that also encompasses the lived mental realities of grief and loss. In short, the day was thoroughly entertaining and educational. A delight to attend! As with most excellent educational experiences, I am left with answers to some questions and many new questions on timely bioethical challenges. Thus course provided knowledgeable lecturers on a wide range of temporal bioethics challenges. The lecturers’ expertise is one facet of this learning opportunity, as insightful and thoughtful attendees from five continents supported global discussion. I listened and considered the state of bioethics’ legal and sociological perspectives from various countries’ points of view. Attendees were deeply invested in learning and sharing. Overall, this opportunity is quite unique and its value will increase exponentially as I bring my newly learned information to my Physician Assistant bioethics curriculum at Pace University and more broadly to my work as a healthcare provider/clinician. The International Bioethics Summer School mirrors the NYC culture, in which people from all over the world coexist harmoniously in a lively and diverse environment. The program was intense, fast-paced, educational and covered an array of topics, from the ethical challenges of in vitro fertilization to bioethics in comics and popular culture. The strongest attribute of the program, apart from its excellent participants, was the professors, researchers and professionals who lectured. The highlight of the program for me was listening to Ms. Madeleine Schachter, a lawyer and professor at Weill Cornell Medical College, Division of Medical Ethics, who lectured on the ethics of collateral health care services by non-credentialed healthcare personnel in international medical crises, e.g. in Sierra Leone during the Ebola outbreak. She was inspiring, informative, and further reinforced my passion for global bioethics and humanitarian work. If you have an interest in bioethics, do not miss this opportunity to meet and interact with such incredible people. The GBI Summer School was an amazing educational experience. I was most impressed with Danielle Spencer’s lecture on bioethical issues in literature and film. Dr. Spencer, who specializes in Narrative Medicine and teaches at Columbia University, presented an unconventional approach to bioethics in showing us how deeply storytelling and bioethics are connected. Using the example of the classic novel “Frankenstein” by Mary Shelley, Dr. Spencer engaged us in an interesting discussion about the question of what it means to be human. Several examples of controversial futuristic movies served as the basis for an enriching conversation about the ethical challenges future medical technologies might pose. Personally, I was fascinated by the ability of stories to influence the understanding and perception of important bioethical topics. GBI’s Summer School was an outstanding program which covered the most crucial issues in bioethics and incorporated international perspectives. The many presentations by notable professors and speakers were informative and illuminating. I especially enjoyed hearing Dr. Joseph Lowy on End-of-Life and Palliative Care, Dr. Sheldon Krimsky on Genetically Designed Babies, Dr. Ilene Wilets on Human Subject Protection and Regulation, and Dr. Gregory Petsko on the Ethical Challenges of Gene Therapy, among others. As a GBI Summer School participant, I learned directly from healthcare practitioners and medical researchers who make extremely difficult decisions that impact our lives as patients. This was applied bioethics, beyond its theory. The lecturers’ diverse areas of practice enabled participants to learn about new challenges that have emerged from scientific and technological developments in various areas of medicine. Additionally, because most participants came from various continents, we were able to learn about bioethical practices from across the world. I recommend this training not just to future bioethicists, but to anyone practicing health research or healthcare, people in the medical and pharmaceutical industries, and those in allied fields such as policymaking and patient advocacy. From my experience this year, I highly encourage participation in the GBI Summer School. The presenters are experts in their fields, dynamic speakers, and highly informative presenters. The participants are from all walks of life, but share a common interest in global bioethics and in bettering the world around them. An inspiring and thought-provoking course. As a doctorate student at Pace University’s Lienhard School of Nursing, I joined this program to prepare to better understand the ethics related to my field. Students were from different backgrounds and countries, and shared their own ideas, beliefs, cultures, and visions for bioethics. The lecturers were top notch; Dr. Frederick Licciardi’s expertise in guiding the class to understand fertility, its management, and related ethical issues was very educational and eye opening. I was touched by Dr. Michael Berman’s take on how to be present with the sick and dying. Dr. Damon Noto’s lecture on organ transplantation, in combination with the powerful documentary “Hard to Believe,” was an awakening moment. As a nurse practitioner caring for hemodialysis patients, I know that this is an important topic to share with patients and colleagues. I am grateful to have partaken in this educative program by GBI! GBI put together an interesting array of speakers including ethicists, researchers, clinicians, and policy experts, and the class was yet further enriched by the diversity of its students. Participants brought insights from different disciplines, countries and ages, fostering lively discussion. As a clinician, the current issues addressed by presenters – such as end-of-life care by Joseph Lowy, MD, right to try legislation by Beth Roxland, JD, MS, and the human rights thread running through many talks – hit particularly close to home. They impact our patients so deeply, and in turn create many of the real world ethical dilemmas we struggle with in caring for them. Throughout the program, I had the opportunity to learn more about global bioethics than ever before. I now understand how examining case studies of scientific research can help solve real-world ethical challenges. For example, when we visited the Memorial Sloan Kettering Cancer Center, I learned not just about the complexity of cancer research, but also the ethical dilemmas that researchers confront in their vital work. Though I already knew some of the issues involved in research ethics, I had never before had the chance to visit a research center and meet with an expert like Dr. Riviere. This is one of the most important opportunities that the summer school program offered me, together with a partial scholarship. This remarkable program helped me understand some of the ethical dilemmas that I encounter in my medical studies and research. Lectures were presented by brilliant professors with both bioethical and scientific backgrounds. We watched documentaries about the ethics of transplantation and human organ trafficking, and had field trips to the United Nations Headquarters and the Memorial Sloan Kettering Cancer Center. Our meeting at the UN with Mr. Stefan Feller touched on many critical ethical issues that the UN faces in different countries worldwide. At the Memorial Sloan Kettering Cancer Center, we heard about recent breakthroughs in cancer research and treatment. Dr. Isabelle Riviere, the Director of Cell Therapy and Cell Engineering Facility, discussed ethical issues pertaining to her research field. GBI staff did an amazing job in selecting the field trips, which made my learning experience in NYC on a GBI partial scholarship beyond exceptional! The trips to the UN Headquarters and the Memorial Sloan Kettering Cancer Center were far more than sightseeing opportunities; they were educational trips loaded with significance. Our meeting with UN Police Division (UNPOL) representative Mr. Stefan Feller about the challenges of internationally policing human trafficking raised many critical issues. I wept for my continent, Africa, as I realized about 70% of UN Police is in Africa. The discussion that followed was highly enriching. 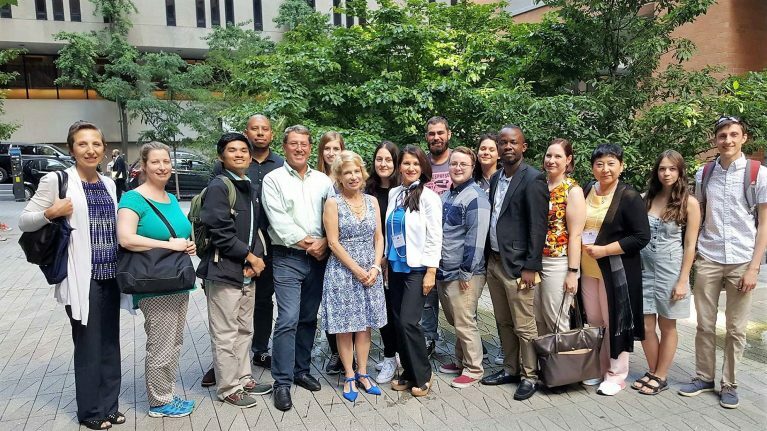 The GBI Summer School in the heart of New York City presented a fantastic opportunity for international scholars and professionals from all over the world. Participants brought their experience and expertise, and engaged with expert faculty in the field of bioethics. In the city of New York, with Pace University, the Brooklyn Bridge, City Hall, and 9/11 Memorial nearby, it was the perfect setting to discuss ethical challenges faced across the globe… Field visits to the UN and Memorial Sloan Kettering Cancer Center provided an amazing glimpse into the real world translation of the classroom discussion. The organized field trips to UN Headquarters, Haven Hospice Specialty Care Unit and Memorial Sloan Kettering Cancer Center were extraordinary learning experiences. The GBI program has been tremendously enriching, and will surely benefit me in my bioethical and medical research and practice. I greatly appreciate Dr. Ana Lita, the director and outstanding organizer of this unique educational summer program, as well as the partial scholarship I received from the GBI to enable my attendance. On our trip to the Memorial Kettering Cancer Center, we learned about the recent breakthroughs in tackling cancer and heard from Dr. Isabelle Riviere, Director of the Cell Therapy and Cell Engineering Facility. She and her colleagues gave a thrilling presentation, which included a slide captioned, “More science, less fear.” It prompted me to think that science involves humanism and allows for better life, though it also implies that scientific developments generate bioethical issues. Essentially, any responsibly practiced scientific field ought to be prepared to grapple with the ethical issues created by its breakthroughs. Indeed, bioethics is a discipline for all of us. Through its unique summer program, GBI proved to be truly committed to doing bioethics in real life!